Jane and Bridget listening to Anne read a letter from their father. (This actually is my desktop background). 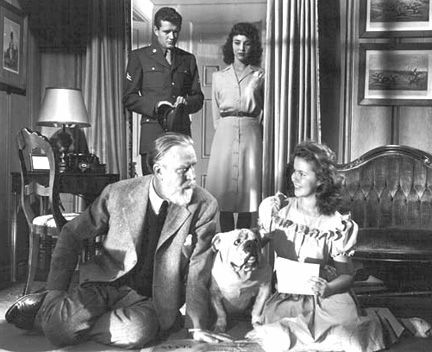 Brief plot: The story of Anne Hilton and her two daughters Jane and Bridget on the American World War II home-front while their father is overseas fighting. The film stars Claudette Colbert, Jennifer Jones, Shirley Temple, Joseph Cotton, Robert Walker, Hattie McDaniel, Monty Wooley and Agnes Moorehead (among several cameo appearances). My favorite time period is the World War II era. One thing that particularly fascinates me about this time is the war effort on the home front-what this film call the “unconquerable fortress”. This movie chronicles life on the home front and daily adjustments Americans went through in order to help soldiers overseas-there aren’t many films that show this. 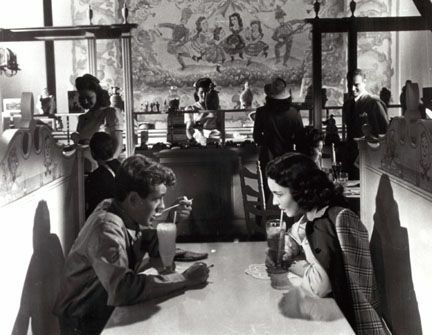 But aside from the historical aspect of the film, the actors, camera shots and script make “Since You Went Away” absolutely perfect. Cast: This film has a very strong, star-studded cast and every actor is perfect. Claudette Colbert does an excellent job as Anne Hilton and Shirley Temple (Bridget) and Jennifer Jones (Jane) embody how I think a 1940s teenager would act. Joseph Cotton plays family friend Tony Willett who used to carry a flame for Anne. Monty Wooley is Col. Smollett who boards at the Hilton home during tough financial times and Robert Walker is his grandson Bill who falls in love with Jane. Hattie McDaniel is the Hilton’s maid, Fidelia, who has to quit and work at another reason residence, because the Hiltons can no longer afford her. However she comes back to live with them, because she doesn’t like the other servants at the new employers home. Lastly, Agnes Moorehead is Emily Hawkins, Anne’s catty friend who thinks war sacrifices mean hoarding food in a cold storage unit and hosting canteen dances. But one very special thing this film is the plethora of uncredited cameos. Tim Hilton, Anne’s husband that has already left for basic training when the movie begins, can be seen in photos. The actor who is supposed to be Tim is Neil Hamilton-known for his role of the commissioner in the 1960s show “Batman” and who usually played cads in early 1930s films. -Silent star Alla Nazimova as Anne’s immigrant friend who works in the shipyards with her. -Character actor Grady Sutton (who pops up in so many movies!) looking for Suzy Flemming at the dance-I wonder if he ever finds her? -And other recognizable faces like Jackie Moran, Craig Stevens, Lloyd Corrigan and Irving Bacon. Emily and Anne in the background of the Paradise Cocktail Lounge-strangers talking in the front. One that makes me laugh every time is when Fidelia brings in a cake for Col. Smullett’s birthday and says she did something different to it. But my absolute favorite part of script is something I’ve always thought was very creative. 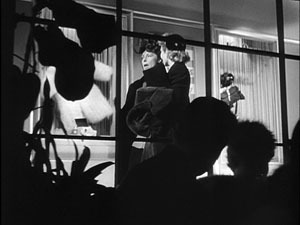 During four separate scenes-Anne and Emily at the cocktail lounge, the canteen dance, the train on the way to see ‘pop’ and the train station as Bill is about to leave. Camera technique: I feel some of the camera techniques in this film might compete with Hitchcock. 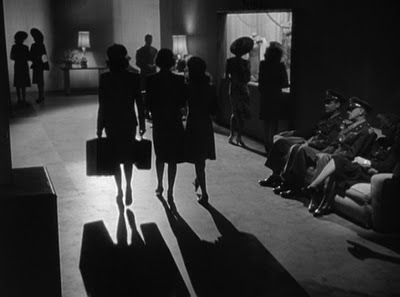 The director took advantage of light and shadows. One example of this is Bill and Jane sitting on the Hilton’s back porch talking. The two are back-lit so we only see their silhouettes. The only light from the couple is when Bill lights his cigarette. Another is when Jane is saying goodbye to Bill at the train station. 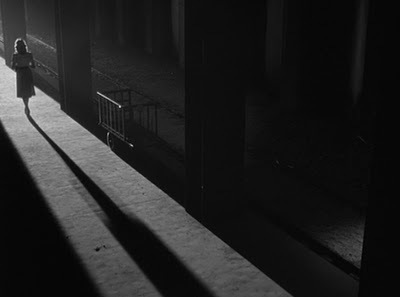 She stands there waving goodbye, the camera pulls back and her shadow stretches about 100 feet across the station. Another shot I really like is when Guy Madison leaves Jane and Bill after they walk around downtown. He gets on the bus and walks to the back, but the camera stays on him as he walks and the bus is driving away to the left and going off screen. But some of my shots are during the dance at the canteen. One part is the shadows as couples waltz (seen at 2:05 in the video below). Also right after they find out Johnny Mahoney dies, there is a shot through a star emblem and you see everyone dancing in the background, very beautiful. Home front: I feel like this movie is so natural and believable not just a bunch of Hollywood stars playing roles. No, not all families were as well off as the Hiltons were before Mr. Hilton went off to war and not everyone’s mother looked like Claudette Colbert-but we see a lot of what I think is pretty realistic. -A cop pulls Tony and Anne over just to chat, because he doesn’t see cars much since gas rationing. -Bridget keeps a plant in the sink to make sure it gets water, because her father gave it to her. -Anne initially doesn’t really understand why Tim enlisted. She doesn’t do much for the war effort to start out with, because she feels like missing her husband and taking in a boarder is enough. By the end she is working in a shipyard. -Jane starts off as a silly, boy crazy high school girl and matures throughout the film. Part of it has to do with falling in love with Bill, but another part of it has to do with her work as a nurse and what she sees at the hospital. -Bridget is in her early teens throughout the film, so she still is pretty young and unchanging, but she seems to be the average, patriotic teenager saying her “Pop looks like a parade all by himself” when he is in his uniform. -We also see a glimpse of war life as people talk about rationing. There isn’t any ice cream at the soda fountain and instead they have a “Victory Punch,” and we see Bridget sorting scrap metal. To review: This film is two and a half hours so I feel like I could write on and on and on about it forever, but in a nut shell-I adore this film. It’s perfect. The shots, the characters, the American life on the home front. Its one that makes you laugh at some scenes and crying in the next. It’s one emotional roller coaster of a film-and I can sincerely say it’s my all time favorite. This concludes Night 4 of Birthday Blogathon Week.